The most common cause of neck pain is overuse of the neck muscles to hold the head up, instead of letting the spine do the job. Try positioning the screen about an arms length away from the chair. The best level to place the screen is always at eye level. Feet should support themselves on the ground. If necessary, lower the chair until feet can sit flat on the floor or find a step to place under the feet keeping knees around 90°. 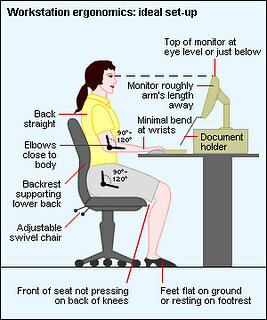 Adjust the seat depth so there is one-to-three fingers' space between the front of the chair and the back of the knee. Position armrests so they are one inch below the forearm. If you primarily use a mouse, try out a chair designed with a pear-shaped back. This type of chair supports the spine, but frees the scapula to move, encouraging whole-arm use rather than motion only from the wrist. A keyboard that allows angle and pitch adjustments is generally best to avoid severely bent wrists. Additionally, a keyboard tray can fix problems such as excessive reach for the keyboard and improper wrist angles when typing. If necessary, place a soft gel pad under your wrists to keep the wrists from breaking and creating harmful angles. If you use a mouse frequently, use your whole arm to move the mouse when possible. If you rest your wrist on the desk for extended periods, consider using a soft gel pad to minimize pressure on the carpal tunnel. You can also look into a graphic tablet that uses a digital pen allowing a more relaxed and neutral position of the fingers, hand, wrist and forearm. In addition to following these ergonomic tips, take 30-second micro-breaks every hour to stand-up, shake out your arms and allow your eyes to focus on something farther away than the computer screen. You might even try taking a short 5-10 minute walk in the middle of your day to encourage some leg circulation and stretching your muscles. We Care! Our chiropractic office is comm itted to keeping your spine- and overall health on the straight and narrow. If you have any concerns about how the ergonomics of your workplace may be affecting your health, plan on discussing it with Dr. Pisarek at your next visit.